Created by NASA to celebrate their 50th anniversary, this Discovery Channel documentary series chronicles the US space program’s fantastic voyage over the past half-century: from NASA’s maiden journey into space in ‘60s to the construction of Earth’s first orbital space station in the ‘90s and ‘00s. Spilling over four discs, it includes never-before-seen film from the NASA archives and new access to 500 hours of space footage taken by the astronauts. These delicate films had only been removed from cold storage two or three times before. Now they’re yours. Of course, the story of man’s trip to the moon was brilliantly told in In The Shadow Of The Moon . Still, that doc didn’t have Neil Armstrong. Because, for years, the first man to take “one giant leap for mankind” has refused to talk about his astronaut career. But here he is. 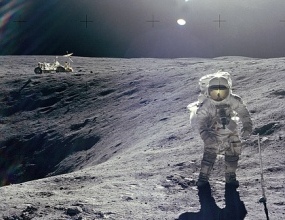 “Our computer was steering us towards football-field sized caters,” says Armstrong, recalling how he landed on the moon’s treacherous surface just seconds before his dwindling fuel supplies would have made a return flight impossible. Narrator (and Apollo 13 star, natch) Gary Sinise is a minor presence. The real storytelling is done by new talking-head interviews with the scientists, mission-control men and astronauts who were there. Even more fascinatingly, When We Left Earth continues the story where most space-docs end. The account of doomed space shuttles Challenger and Columbia rapidly morph the doc into a gripping true-life thriller. It’s unflinching stuff: the Challenger explosion is shown in newly declassified footage, coupled with gasp-snatching film of the astronauts’ parents watching the shuttle explode and the stunned faces of mission control. Agony turns with joy – the nerve-shredding tension stays the same, mind – when a veteran space crew soar up to twice the usual orbit above the Earth and deploy the Hubble telescope. But when Hubble turns out to be near-sighted (a multi-billion-dollar dud), it results in an awe-inspiring space-walk repair mission that’s as riveting as any sci-fi blockbuster. Tough to rate on Blu-ray because, even with colour-correction, video quality swerves massively between battered ‘60s and ‘70s camera film and gleaming ‘90s and ‘00s footage. Perhaps you could save yourself £20 by punting for the DVD instead, but talking heads are all rich and clean, and when the later footage starts to unspool, HD gives it a lovely hyper-reality. Not a package that needs bonus supps, but each disc straps on highlights from more NASA films and extra interviews. Disc Four is a grab-bag of NASA-produced documentary films from the ‘60s – vintage promo curios rather than anything compulsive. Sure, you could quibble. You could say the presentation is a bit straight-faced. No filmmaking wit here. The dramatic musical score is overbearing at times. Inevitably, the Russian side of the story remains fairly unacknowledged. But with 40 years pressed into nearly five hours, nothing else on disc that comes close to the sheer scope and scale of When We Left Earth. A unique insider view of the intricacies and the full history of one of the most staggering accomplishment of the human race. Addictive, essential viewing.